A petrol station in Sheffield has adopted a novel tactic in its battle with thieves plaguing the store - and it says the approach is paying dividends. Rogues galleries of suspected offenders are a common sight behind shop counters, but a store just outside the city centre has gone a step further by sticking wanted photos at the entrance for all customers to see. Bosses at the SPAR store on Bramall Lane first plastered the CCTV images to the glass facade just over a week ago after growing increasingly frustrated by the scale of theft, and they say the tactic appears to be deterring would-be crooks. 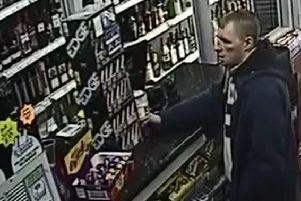 Assistant manager Luke Harper said: "We hope the offenders spot the photos and realise we're watching them. "The drive-offs seem to have stopped since the images went up, so I reckon it's working as a deterrent, and we're going to carry on doing it. "We always have an extra member of staff watching for shoplifters. "You get shoplifters and people driving off without paying everywhere, not just here. The drive offs have been a weekly thing." The posters are not like police appeals, with information about the alleged crime and how to report information. The CCTV images are simply labelled 'shoplifter' and 'drive off' - with the latter also including the registration number of the vehicle in question. Mr Harper said the same man is believed to be responsible for the frequent fuel thefts, though he uses a new number plate and often a different vehicle too each time he strikes. He says the alleged shoplifter pictured is only believed to have targeted the store once but attempted thefts are a weekly occurrence. "Shoplifting tends to be worse at the end of the month - possibly because it's been so long since pay day," he added.